Okay, I already hear the question: How can I “know” I will be cured? Simple. It is a choice. Do you want to be cured? Then decide that you are going to get what you want and decide that you will put up with whatever you have to put up with in order to achieve your cure. Simple…in theory. Difficult in practice. Why? Because Parkinson’s is a symptom of your life out of balance, and until you restore balance to your life, the symptom called Parkinson’s will remain with you as a reminder that you have more work to do. Knowing you will be cured. In the beginning of my journey, I knew I would be cured one day. Sally knew it, too. Our children knew it, too. We just decided it would happen and none of us looked back. 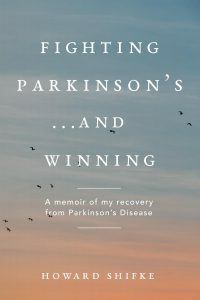 I was so confident in my recovery, never showing fear of Parkinson’s or concern over increasing symptoms, and as a result, they all were completely confident in my recovery as well. Click here to see how my rigidity was one month prior to my full recovery. Of course, I had no way of knowing I was one month away from my full recovery. However, I already had accepted the symptoms as part of my recovery, so I was not consumed by them or afraid of them. My fears had been in two places: 1. That the known path my mother had followed resulted in her being crippled in a wheelchair with barely any voice to speak, and that the Alzheimer’s and Dementia from 20+ years on medications had rendered her mindless three years before she died; and 2. Life. Fear of not being perfect enough or having all of the right answers or making everybody else happy or being in control of everything…. As you can see, Parkinson’s is a symptom, a manifestation, of all of these imbalances in your life. Why does it manifest in such harsh physical symptoms? I will be the first one to step up and answer (admit) this one: Because if Parkinson’s did not provide me physical symptoms that lasted until the day of my cure, I would not have fixed the physical, mental, and spiritual imbalances in my life. I lacked the understanding and motivation to change…to change what? Me. The me I had become…that guy had Parkinson’s. Symptom relief: If your ceiling has a wet spot after it rains, you can paint over the symptom (the wet spot) and mask it. The next time it rains and the wet spot is larger, you can choose to use an increased amount of paint and paint over the symptom (the larger wet spot). If you do this again and again and again without ever addressing the cause of the wet spot, one day, the entire ceiling collapses and falls into your home. The Recipe: If your ceiling has a wet spot after it rains, you look for the cause. You find the roof issues and you fix them. This is recovery. Then, when you actually fix the inside of the ceiling by replacing the part with the wet spot, you have cured the problem completely. One way solves the problem, and one way leads to complete collapse…it is a choice. Finally, be patient. The journey you are on is life. When you cross the final finish line in your life, it is death. I haven’t heard one person say they are in a hurry to reach the final finish line in life. Slow down, and please be patient and enjoy the journey of life. Feel your recovery in your zest to be alive, in the joy in your heart, in your compassion for yourself and others, in your love for yourself and others. And be grateful. It changed my life the day I became grateful for being alive, even in a Parkinson’s body. I cherished the breath of life and was grateful. I still am. Know you will be cured. Do the Recipe. Make it happen. Be your own cure! Thank you so much Howard. dis-ease, the manifestation of the imbalances. Gratefully living my recovery by listening to the harmony of my essence. Being present in the present. Thank you Howard. Love and Blessings to All. How humbling? And how humiliating — to see and feel this so close up through your blog. And, strangely, I feel a sense of optimism, as I know humility (not humiliation) is within my reach. muchas gracias por tu valioso apoyo Howard , es un baño de energia positiva en mi vida, eres un ser maravilloso, seguimos firmes con la receta. thank you very much for your valuable support Howard, is a suite of positive energy in my life, you are a wonderful human being, we stand firm with the recipe. Thank you Howard for a beautiful most helpful post. It is good to be reminded of the areas in my life that need changing. I am very faithful in getting the physical exercises done everyday. I know that this is a good thing as it demonstrates to myself that I have the faith that I will get better. I am physically doing something that will help me to gain back my health. It improves and balances out my physical self. This is very important; however I feel I need to be just as diligent in knowing how, and then working on the mental and spiritual me, while showing compassion and acceptance for my lack of perfection……. This post was perfect in reminding me of the great progress that I have made in these areas of my life, while allowing me to clearly see that there is more work to be done. I am working on a permanent fix for my roof (my health and being Parkinson’s free). Thank you Howard for addressing issues that needed to be address, that needed to be worked on, and that needed to be changed in my own personal life. I am grateful to God for my life and for the love and guidance I constantly feel. I am grateful for the knowledge that Howard so fearlessly found and now so freely shares with me. I am grateful for the opportunity I have to express myself on this blog. I am grateful for each of you who share with me. I am very grateful that I have the tools and the ability to put them to use, to be Parkinson’s Free. Hi Howard and fellow warriors, beautifully said Debbie. I agree, fabulous reminder of the list of ” out of balance”. I was pleased as I read each list that there was many that I have dropped from the list. It brought a smile to say ” yes Karen you’ve healed from that and that” but equally was fab to be reminded of the areas I still need to work on. Howard Shifke, you are one of Gods finest gifts to me, and fellow warriors, I walk the walk with you with love, affection and compassion. We truly are warriors because we all have strength and courage and are aiming for ” the way of the peaceful warrior” in finding that peace, love, joy and happiness in our hearts. I know it is sitting dormant for each of us, we just have to gently tap our way into it, and we will. Happy happy Easter to all. With Big Love and Gratitude. Oh, how familiar those Parkinson’s traits are to me. I have to constantly remember to forgive myself for fixing the leak instead of finding the cause. I’m so grateful for you Howard and for the community you have created. Thank you so much. Dear Howard, thank you so much once again for your latest post – as usual you are spot on. I too am working on the areas that brought Parkinsons upon me and reversing the way I’ve been to become that shiny teapot! Slow and steady wins the race ! We can do this! Much love to all! 🙂 🙂 Have a great weekend and keep on keeping on ! Bless you Debbie, our little Ms Sunshine! You are always so warm and encouraging to us all. Warm wishes back to you my friend. hola karen, se que estas pasando por momentos dificiles al igual que muchos de nosotros, mi apoyo moral para ti KAREN que eres muy valiente es un verdadero reto, hagamoslo. Hi Karen. You are going through difficult times like many of us, my moral support for you KAREN you’re very brave is a real challenge, let’s do it.